This post is going to look a couple things. First it's a review of the Masq-Mini tube tool for making power cables, hoses and tubes. Second, it's going to look at a few other ways to do the same thing. As a side note, I'll be posting another review covering a second tool that does something similar. One of the comments in my Necron Ghost Ark post included a link to Green Stuff Industries Tentacle Maker. I decided to get my hands on one of them for a test drive and will have those results this Wednesday. When I posted this picture of my Necron Ghost Ark conversion the other day, I got a ton of emails asking me about the tubes connecting the pilot to the vehicle. 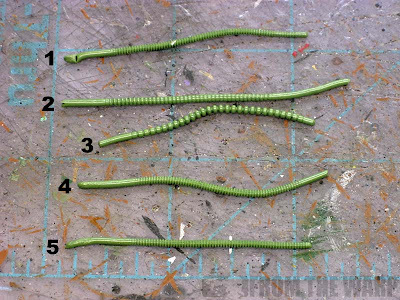 For the longest time, I've been trying different methods at making greenstuff hoses. My biggest need was for Librarian psychic hoods. I started out rolling out my own greenstuff cables and cutting the indentations into them by hand. It works, but there are better ways. Then I found guitar strings (forget those) and then metal power cables from Dragon Forge. A step up in the evolutionary power cable food chain so to say, but they are not without their issues as well. Then this tool from Masq-Mini was given to me by a fellow hobbyist to try out. I tried to contact the company a while ago for more info, but I haven't heard back from them just yet. I didn't get any real directions with it, but there is a video on their site. I've included the video here for folks to see. The point of sharing the video is that it looks very, very easy to do. But there are a few things not obvious in it. One is that the guy making the tubes knows exactly what he's doing and can get spot on results every time. The other important factor is that he's using what appears to be Milliput or ProCreate and not greenstuff. A minor, but important factor I'll come to later on. 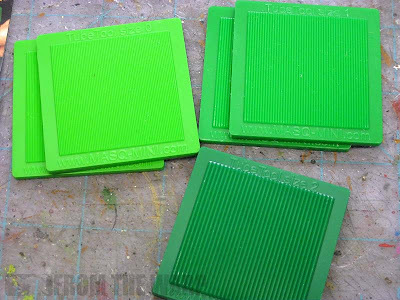 You get three different sizes of "plates" if you will so you can make a few different scale hoses and tubes. This is a really nice feature and gives you lots flexibility you wouldn't have with one standard sized plate. The multiple plates is big thing since it allows you to build your tubes for the purpose you have in mind. Need something small scale to run along a chest plate, it's there, want something bigger for connecting parts on a vehicle, you've got that too. They (the plates themselves) are a bit small and the "tube" working area is just under 1.5 inches (40mm). This means they'll work great for infantry applications, but not so much for vehicles. That was a problem I had with my conversion. I needed power cables that were about 2 inches and I had nothing that big. I had to leave the excess ends attached so I could use them on my Necron vehicle. Not a big deal, but something you need to keep in mind since your tubes will be fairly short in the end. The video shows how the creator uses it and it's worth noting you'll need something to keep the plates lined up while rolling them. Otherwise your tube comes out worthless. My first attempt found me using an old CD to keep the plates lined up. This kinda solves one problem but creates two more at the same time. 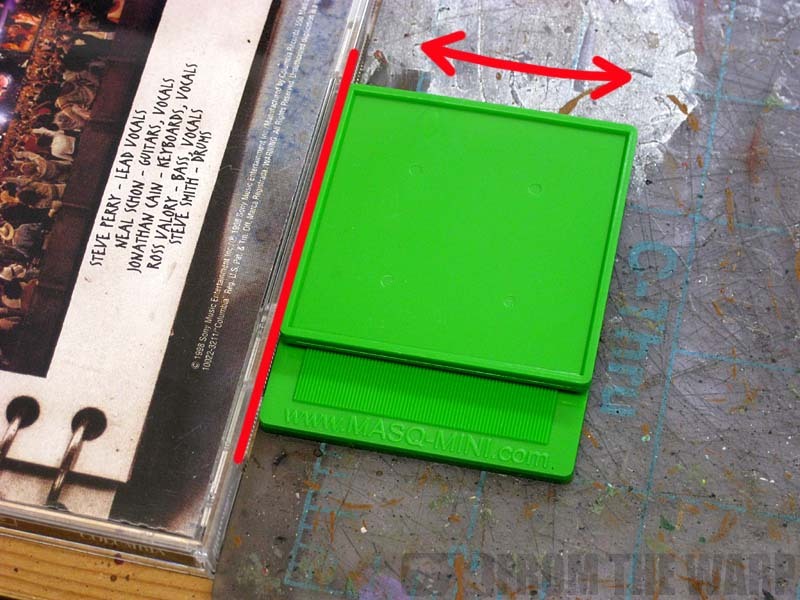 First is that you need to find a third hand to hold your alignment piece (the CD) in place, hold the bottom plate in place and then hold the top plate in place while rolling it. Second, you can't see the tube as it's rolling and it can easily work it's way out from in between the plates as you roll it out. For as big of a problem as this is, there is a small benefit to not having a set handle on the plate. It allows you some (and I mean a tiny bit) of flexibility in positioning the plates at different angles to get different effects. This would be much harder if there was a handle attached to one plate as it would most likely get in the way. I did find that I had to use a bit of water to keep the greenstuff from sticking, but that's nothing new to those who use it regularly. I'd say to keep to water though as things like cooking spray and oil make the plates too slippery and the greenstuff won't roll... it will just slide (trust me on this one). Positioning the greenstuff needs to be accurate as well. It's best to have it perpendicular to the direction you'll be rolling the plates and try to get it in the middle as well so you have some leeway in each direction and your tube won't pop right out as you start to roll. Leaving a little bit hanging off the edge will help when it comes time to pick up your tube and handle it. After lots of trial and error, I came up with a way that sort of works for me. I'd say most of the tubes I make are usable, the rest have some form of defect and can be used in less obvious places or were already scrapped and re-rolled while still pliable. For every 3 or 4 tubes I roll, I get one that is worth keeping. 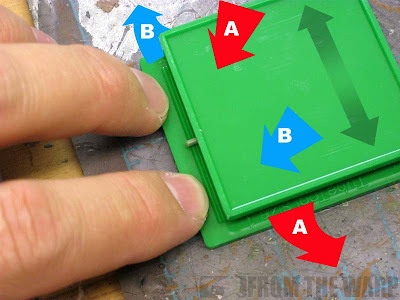 Instead of using a CD to keep the plates lined up, I've opted to use two fingers and push the top plate over to them and run it along my fingernails. It's not the best, but it does allow me to watch the greenstuff as I roll it out and can make adjustments before it pops out while rolling. Press too hard on A while rolling back and forth and it pops out on the bottom, press too hard on B and it pops out the top. This is a constant source of aggravation when making tubes. I collected these and saved them as way to show you a few things to look out for when using the tool. 1. Debris must be cleaned up prior to making tubes. Anything picked up by the greenstuff will be seen in the finished power cable. 2.You need to have constant pressure across the whole surface (in addition to making sure you don't press too hard in one direction or another) otherwise you'll get an uneven tube with more of the effect in one place and nothing at the ends. 3. Press too hard and you can cut the tube in half (or one end off). Notice how little is left of the tube in the middle area. This comes more from the top plate being slightly angled one way or another while rolling and isn't from the plate itself bending. That combined with the tube possibly being slightly different in diameter when you started. 4. This one is ok, but it's cured in a twisted position. Greenstuff tubes need to be cured in the straight position otherwise they are near impossible to bend just the way you need them to later on. 5. What we're looking for. Fairly consistent across the tube, not too deep and cured in a straight line. This we can use later on. Now I did not venture too far into making other things like rope or tentacles. It is possible to do, but I had lots of trouble getting my rope to come out right. It was always either too thick or it didn't look like rope when I was done. Since that's probably a result of user error, I kept to making tubes and hoses since I could do those relatively well after lots of practicing. The original video shows the creator using milliput or something like ProCreate and not greenstuff. And for a good reason. Let it cure a bit and since it's a softer material than greenstuff, it rolls easier and captures slightly better detail. The drawback is that the milliput ones must be used after they are made, you cannot let them cure overnight in a straight position since milliput hardens rock solid when cured and cannot be bent. Well, this guy comes in at just over $30 US before shipping and handling. The price alone is just a bit too high for my liking, but then again I am cheap. I think it's got some great potential and for the money, you do get three different sizes to work with so it's hard to complain that much. No handles to hold onto them with, but at least three different sizes to work with. 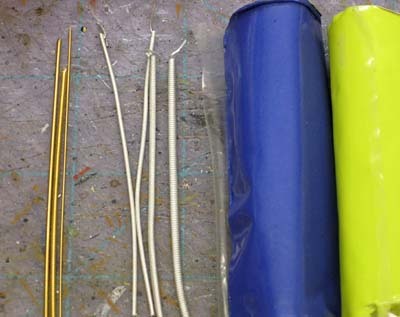 If you're making lots of power cables and hoses for infantry models, this might be the trick for you. If not, you might want to look at an alternative method. There's some learning that goes along with this thing too, you're not going to pick it up and presto, perfect tubes every time. Be prepared to do some real practicing with it before you get something usable. Practice with it enough and you can get some finely detailed power cables and such with great detail. You may want to look at using milliput or ProCreate as well and not just greenstuff. Sure, you can let greenstuff cure and you can come back to it later, but to really get the best detail, you probably should use milliput and then you need to make the tubes and position them immediately so they can cure in place. If you do lots of conversion work and you constantly find yourself needing to make tubes/hoses/cables on a regular basis and you don't mind dropping good money, then this will help you and speed up the construction process after you get a handle on using it. It's got the flexibility and can be used to make a varied selection of tubes. Otherwise, save yourself the money and the time and buy some pre-made ones or make your own for that matter. I think the alternatives out there are probably better for your average hobbyist who needs to make a single cable or hose for that one conversion they want to do. Thanks Ron, always nice to get the low down from someone who has experienced the learning pains. The result you got on that Necron Ark conversion makes me think that maybe it's worth the pain... it really did look fantastic. OK, it's Green Stuff Industries. FluffyPanda: It can be, if you're willing to work at it. Looking closer at the model, none of the tubes are the same. They are all different in diameter and texture. It can be problematic getting a few tubes that are spot on similar so you can be consistent across a model if need be. GDMNW: Yep, got that one too. Review to be posted this Wednesday on it. What about using Brownstuff? I would think if Miliput or Procreate works well, that Brownstuff will work better. Greenstuff's one advantage over both is its tensile property, but its also more for the lack of better word sticky. 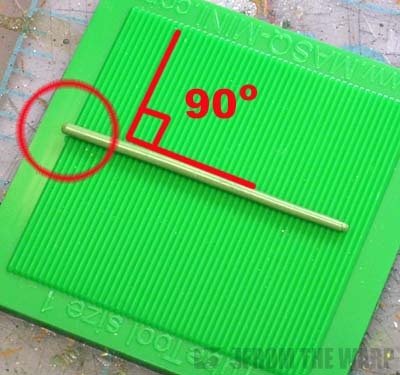 For an edge or guide, maybe consider a T-Square, which would require a nice straight on your desk. Ron: Nobody said they all had to be the same. 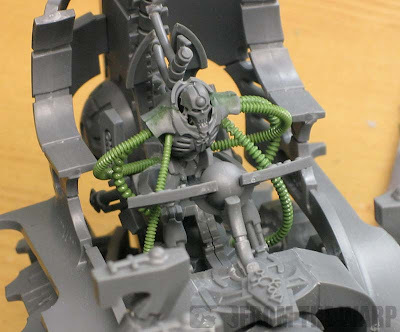 I guess even Necrons will use different gauge cable for different purposes. I like the writhing look you've achieved. after reading all this, the powercables from Dragon Forge seem to me the way to go. They are easy to work with and come in many different sizes: besides they are cheap. PsychosisPC: Didn't think of that stuff. Here's my issue with that though... now I have a tool that requires the use of a specific modeling putty in order to get the best results. You would think that making something like this would be geared towards greenstuff as it's probably the most popular of all sculpting epoxies out there. FluffyPanda: True, they don't ahve to be the same in this case. But... if I'm building a Librarian model, the last thing I want are different sized and shaped cables across his chest when they should match. SC Mike: They are a nice option. They can be tough to get in position sometimes though. That and repeated bending (from trying to position correctly) will break the smaller diameter ones quite easily. Still, they have the benefit of being consistent in their shape and size which is certainly required in some applications like psychic hood cables. Understandable. Brown Stuff is great for things with sharp edges and less organic type sculpt. My guess is that it would yield better results but only if you bend it into the general shape prior to it being completely cured due to it's tensile properties being different. Interesting tool, thanks for sharing your experiences and the tutorial video about it. I've one question about this: What would happen if you used a "core" as some kind of thin wire covered with GS, would it help the piece remain straight while rolling or when bending after cured? PsychosisPC: Brown stuff... is that the brand name or what people call it? I may have to try some of that out then. I bought Milliput the other day for this project so I might as well try "brown stuff" too. Kynikos: No need at all. Adding a wire would only create problems if you ask me. 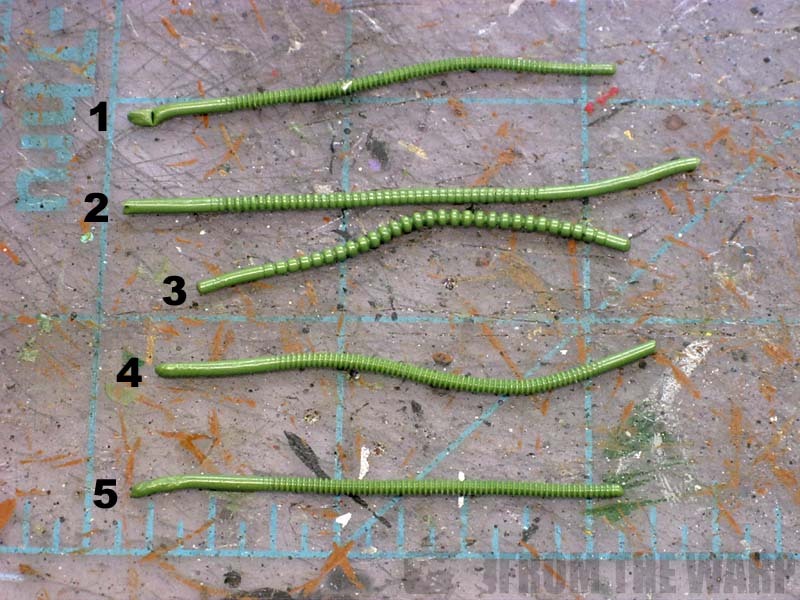 I can't imagine trying to keep the greenstuff a consistent thickness around the outside of a wire and then rolling it. 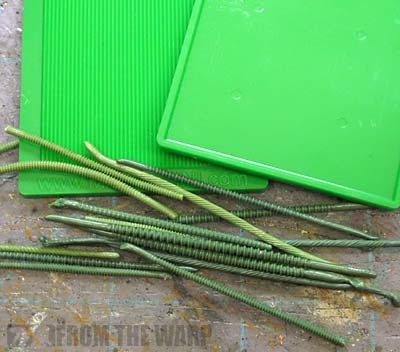 Greenstuff tubes can be tensioned ever so slightly after removing them from the tool to make them straight. No problem there. If you lean towards the yellow, then they are a bit more flexible when cured too. 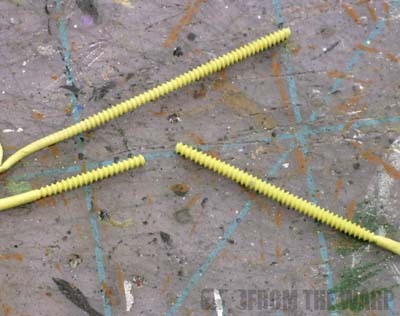 If anything, on your thicker tubes, you might drill out the end and then insert a short pin to hold the tube in place like you would any other tiny piece on a model... but that's for the thicker tubes only. The thin tubes bend easily enough. The milliput bends easily as well. Even easier than the greenstuff. I waited for about 30 - 45 minutes for it to cure before rolling. Placing it right after is easy enough to do and since it's cured partially and it holds it's shape.